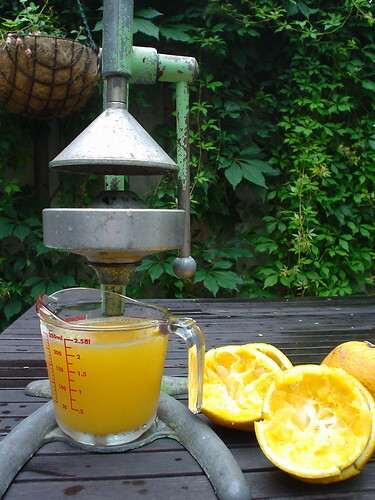 Vintage Juicer, originally uploaded by the workroom. When you’re making stuff, it’s essential that you’ve got the best tools possible. Not only does it make your job easier, it often can make it quite fun. My favourite tools not only work like a charm but look pretty to boot. Yes, looks do count. The more I love my tools, the more I use them. It’s a proven fact. When I bought this vintage juicer years ago at the 26th Street Flea Market in New York, it was purely for its looks. I had no intentions of juicing anything and my shopping partner, Dominic, enthusiastically supported the purchase purely for its vintage cuteness. I can’t even remember how much I paid for it. Perhaps $20? It sat in my kitchen in Hoboken, looking lovely and never got near any citrus fruit. When I moved back to Toronto, it had a new kitchen to sit pretty in. One day, as I was getting ready to squeeze some lemons for a recipe, it occurred to me to try the juicer out. I cut the lemon in half, popped it under the press and cranked the handle. Not only did it get every last bit of juice out of the lemon, but it felt really satisfying to do it. Juicing lemons became a favourite activity. Any recipe that called for lemon juice was made with zest; fresh squeezed lemonade, salad dressings and lemon loaf. The funny thing is that it never occurred to me to squeeze oranges. It’s so obvious! Just this weekend I was looking at a slightly old bag of oranges in my fridge. I was sad that they were past their prime and wondering what to do with them. FINALLY, I made the connection. Fresh squeezed orange juice!! Six oranges made two tall glasses of sweet yummy orange juice. Oh, juicer, you get better and better as time goes by. Last night I juiced limes to make this lime yogurt sorbet. Yum! It’s quite tart, the way I like it and incredibly easy to whip up. (with the right tools) I didn’t make the grilled peaches to go with it. Now that I’ve had the sorbet, I’m curious to try the two flavours together. I’ll pick up some peaches today.